I do use it to quickly transfer screenshots that I take on my Android device to my PC so that I can use them in articles that I write here on the site. The latest experimental build of Dropbox introduces the same feature to the desktop computer. Once you have installed the new version you will notice that it will automatically map the print key to it. That's problematic for users who have the key mapped to another program on their system as it unmaps that connection. When you select save screenshots to Dropbox all screenshots that you take using the print key are automatically saved to a new screenshots folder on your Dropbox. It is automated and works identical to how this works on mobile devices. 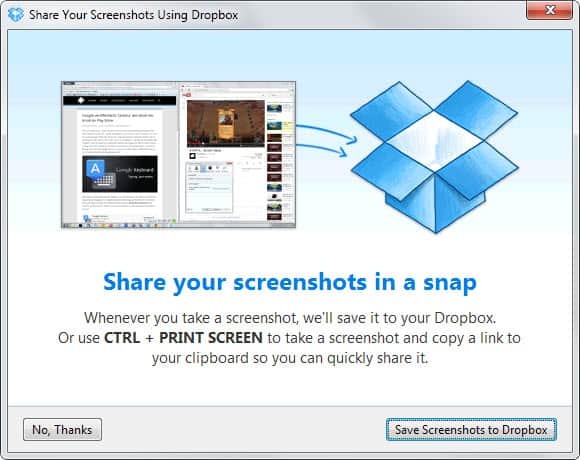 You can also use Ctrl-Print to take a screenshot, get it uploaded to Dropbox and copy the sharing url of it directly to the clipboard of your operating system so that you can post it online or share it with others. Now, the problem for users who do not want the feature is that Dropbox maps the key to the application so that another app that you may have been using instead does not anymore. If you are using screenshot taking software and want to continue using it, you may run into issues because of this. What you may need to do is open the program you are using and remap the keys to it so that you can continue using it the way you have before. I'm not entirely sure if Dropbox won't map keys if you hit the no thanks button the first time the window appears on the screen. But since it appears the first time you hit the print key, it seems to map the print key automatically. You can disable the screenshot taking functionality of Dropbox in the preferences under import. Pro Tip: You can combine using your own screenshot taking application on the desktop with Dropbox's sync feature by simply saving your screenshots to a Dropbox folder. It may not be as automated depending on the program you are using but it makes sure that you can use the best of both worlds. 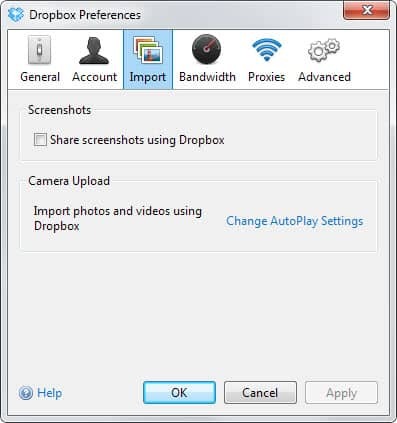 The screenshot to Dropbox feature is currently only available for Windows and Mac OS X. Move to Dropbox is a new context menu item that you can use to move the files and folders that you have selected into the Dropbox. Import from iPhoto, a Mac-only feature that creates iPhoto albums and events as Dropbox albums. Download and upload speed improvements for large files. You can download the latest experimental version of Dropbox from the official forum. Developer’s tip: this should not be on by default.